Happy New Year to all Essentially England readers! I know January is well underway, but still – there's always time for a few good wishes. For me, 2012 will be a very busy year. I thought that starting new jobs and moving to a new area was busy, but setting up a business from scratch is a whole different ballgame. Still, I get to do what I love - teach, build websites and work with local businesses to improve theirs - and that's something that makes getting out of bed at 4.30am every morning ridiculously easy. It's our first anniversary of moving from the Cotswolds to Northamptonshire, and while everyone knows about the Cotswolds, this area is a bit of a forgotten gem. So I thought I'd spend a little bit of space in this month's newsletter extolling its virtues. I promised to show it off, didn't I? Who would have thought that England could suffer a sword shortage? I should have considered that - with the season for re-enactments and history festivals all but over – swords would be in less demand during the winter and bought one at Bosworth. Still, the very helpful folks from Blades UK came through in the end. It's an early medieval single-handed sword with a straight cross-guard. 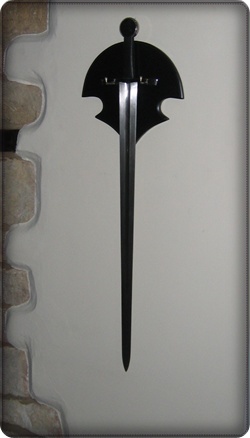 A sword like this would have been a common sight in England during the 12th and 13th centuries, and most knights going on crusade would have carried a weapon similar to this one. 40in long and a bit heavier than I expected, it's also a bit more unwieldy than a foil… which is all I've been used to up until now. Still, it makes exercise fun – who needs weights for a workout? There's a lot to do in Northamptonshire, whether you're a history fan or not. First of all, Northampton itself is famous for shoes - producing them, that is. The local football team is affectionately known as The Cobblers and if you admit to a shoe fetish of any sort, you should visit the local shoe museum. Most people will probably meander their way around Northamptonshire by car, but why not try something a bit different? Explore Northamptonshire: by narrow boat on the the Grand Union Canal. 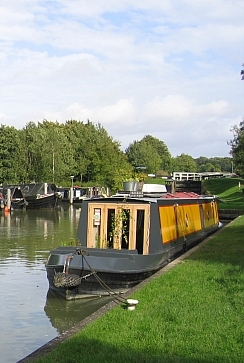 Watch the countryside pass by, work a few locks, navigate the 3km-long Blisworth Tunnel, or have an informative day at Stoke Bruerne's Canal Museum. Visiting stately homes is an activity that should not just be reserved for a rainy day. England's grand houses usually come with the most wonderful landscaped gardens - so you really don't want to miss out there. Kelmarsh Hall, built in 1732 in Palladian Style, is famous for its annual Festival of History and its beautiful gardens. Boughton House, the Northampton home of the Duke of Buccleuch, has an outstanding art collection including over 40 painting by Van Dyck. And Althorp is, of course, best known as the childhood home of the late Princess Diana. For lovers of horse racing, there's Towcester Racecourse, which makes a real fun day out, and if you prefer speed of the four-wheeled variety, then you've got Silverstone and Santa Pod raceway right on your doorstep. Not such a forgotten part of England after all, is it? Ginger is simply everywhere. It used to be a favourite flavouring during the Medieval and Tudor periods and many traditional recipes listed it as an ingredient. Then there was crystallised stem ginger, ginger cordials and steamed ginger pudding - and now there's Ginger Fruit Punch. Apart from its great fresh taste, ginger helps you keep cold germs at bay during the winter season, so it's well worth making this refreshing ginger-flavoured punch, whether you have a party to cater for or not. Mix all ingredients well together and add more sugar if it needs it. If you're using an alcoholic ginger beer, such as Crabbies here in the UK, then I'd leave the sugar out altogether, as the beer is sweet enough. Just go with your tastebuds – and serve over ice. I wonder if this goes down particularly well in the antipodes… you should be baking in the mid-summer heat,ne? Well, I'm feeling medieval and – since it's Valentine's Day – I might tell you a touching Royal love story. How's that? And don't forget: you can keep up with our news onTwitter and Facebook. See you there!